Photo: Logan VonBokel | VeloNews.com (File). Lennard Zinn answers questions about tubulars, how to mix and match 10- and 11-speed parts, plus more thoughts on kit tailoring. I’m entered in the 85-mile version of L’Eroica California and will be on sew-ups. I started using these tires in 1972 and am quite familiar with their use, with one exception. I know nothing about the stop-leak products such as Stan’s. I’ll be riding 28c Schwalbe Ones. Should I “load” them with sealant? Will this chemical damage the tire over time? Is this ride particularly prone to punctures such as the California lionhead thorns? I can speak from a lot of experience about sealant in sew-ups (i.e., tubular tires), but I have no idea about the prevalence of thorns along that particular route. If you find out that there are a lot of thorns there, then, yes, I’d recommend sealant, but not Stan’s, or some others, for your latex tubes, as I described here. In that post, I quote Richard Nieuwhuis, the owner and director of Dugast, attributing “cooked” inner tubes to the use of “natural latex-based sealants.” He recommended Effetto Mariposa CaffeLatex sealant, which, despite looking a lot like latex-based sealants and having latex in the name, actually has no latex (or ammonia) in it. I have used CaffeLatex in lots of cyclocross tubulars, and I never got a flat with one, despite riding through numerous areas rife with goathead thorns. One particularly memorable experience was at a cyclocross race at the Boulder Reservoir where the course not only had lots of goatheads on it, but the weedy field set aside for parking was absolutely covered with them. People were getting flats right and left around me, and I pulled dozens of thorns out of my tires on the starting line, but I didn’t lose noticeable air pressure during the race or after (beyond the usual bleed-down that always happens with latex inner tubes). I used those same tires for the rest of the season. I will say that, having tried this many times and ruined many good, latex-tubed tubulars in the process, you cannot remove the sealant from your tubulars’ latex inner tubes (with a shop vacuum and water rinsing, you can get it out of tubulars without tubes, like Tufo and Clement. The concern, of course, is the sealant hardening up inside, where it has pooled up during storage, thus unbalancing the tire. I suggest never opening your valve other than during inflating and adjusting pressure. Leave it closed during storage to prevent air circulation inside. And rotate the wheels periodically while not in use. I built a bike up for my wife with 11-speed 105 (5800). She does not like road bars and I want to convert it to flat bars with trigger or twist-grip shifters. Are there shifters, other than STI, that will work with my existing 11-speed 105 derailleurs? Thanks. No, I don’t think so. Shimano makes road flat-bar levers for 8-speed, but not for 11-speed. 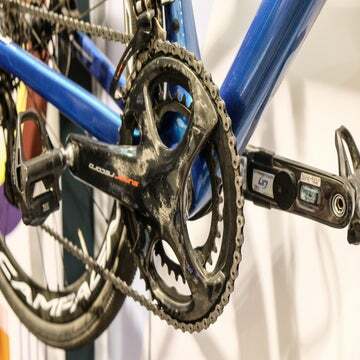 When Shimano went to 10 speeds on mountain bikes, it made the cable-pull ratios different on road and mountain shifters and derailleurs, so 11-speed MTB shifters will not work with that road rear derailleur. You could get an 11-speed MTB rear derailleur and shifters and sell the 11-speed road rear derailleur. Then you could use her existing cogs (and maybe the chain, if you get an MTB rear derailleur with a similar cage length to the road rear derailleur). You received a question from a reader about flat bar shifters for 11 speed Shimano. 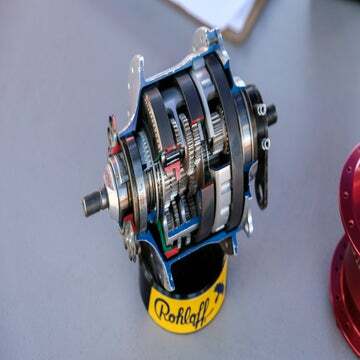 I have done projects like this in the past and Shimano does make such levers but does not really advertise them well. Shimano maintains a compatibility chart and there are 8-, 9-, 10-, and 11-speed shift levers that are compatible with road derailleurs. The downside is they are not integrated and require separate brake levers (which can be found just above the drivetrain chart). Eric can buy either SL-RS700 or SL-U5000 shifters and choose from a large number of brake levers (BL-4700, BL-R3000, BL-3500, BL-R780, and BL-2400) to work with his wife’s otherwise 5800-equipped bike. The other day I was converting my bike to SRAM Red 22 from a SRAM Red 10-speed set up. Unfortunately, the right shifter was broken in shipping and had to be sent back for a replacement. I ended up reinstalling the old, right 10-speed shifter and 10-speed cassette, but left the 11-speed chain on. I noticed that it actually seems to shift better than the 10-speed chain (it was a fairly new chain, so wear is not the issue). 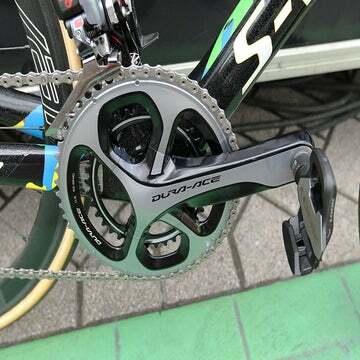 First, is this a problem to use an 11-speed chain with 10-speed components, and if not, is this something other people might want to consider doing on purpose? It’s fine to use an 11-speed chain with a 10-speed drivetrain. If it works better for you, then that answers your second question. I’m in the need for a new pair of SRAM shifters, but don’t want to invest in upgrading my entire drivetrain to 11-speed. With 10-speed parts becoming more difficult to find (and sometimes more expensive than 11-speed), I’m wondering if SRAM 11-speed shifters work with a SRAM 10-speed rear derailleur? I believe in previous column you stated SRAM didn’t change the pull in the move from 10- to 11-speed, so will adjusting the derailleur limit screw just take up the extra “click”? Also, I’ve read your column about 10-speed Campagnolo shifters working with SRAM 10-speed rear derailleurs. Is there any difference between the performance of Rival vs. Force vs. Red? More specifically, I’m wondering if there’s a difference is spring strength that could affect performance? Yes, SRAM 11-speed shifters work with SRAM 10-speed rear derailleurs. You don’t need to worry about the “extra click” in the lever. As long as you correctly set the cable tension and the low-gear limit screw, everything will work fine. And that will work far better than a Campy lever with a SRAM rear derailleur, which works in a class-B way. Performance is the same, when new, between Rival, Force, and Red rear derailleurs. This seems like it wouldn’t be a big deal, but I haven’t found anything stating much about the crankset aspect and was wondering if I could go with an 11-speed crankset with the rest of the groupset staying 10-speed? Should I use 11-speed or 10-speed chain in this instance? My Rival 22 crankset says to use with the Yaw front derailleur only; is this a ploy to make sure you purchase the same groupset throughout or is there something to that? Yes, you can use an 11-speed crankset with the rest of the groupset remaining 10-speed. You can use a 10-speed or 11-speed chain. Any decent road front derailleur will shift your Rival 22 crankset. That said, the Yaw front derailleur is very nice and is a big improvement over SRAM’s previous road front derailleurs. Like Bill I’m long torso, short legs. I’m also 5-foot-7 (actually 5-foot-6-1/2) with about a 28.5″ inseam. As a custom frame builder you’ll appreciate this — I ride a 40cm c-c (modeled after a size S TCR aluminum; I’d normally ride a 50 cm), 75.5 STA, 56.5cm top tube. On the 9.5cm head tube I run a -32-degree, 14.5cm-long stem (to get the compact bar drops to the same place as my old bars with a 12cm, -17 stem). I’m definitely short-legged, long-torsoed. There are some custom kit companies that do small runs and will, if asked, make alterations at no charge. I can’t remember who offered what, but I’m pretty sure Verge, VOMax, and Hincapie offered something like this to our club. Verge for sure — we asked for, and received, jersey-type backs on their otherwise stock wind vests. Hincapie (not sure of their minimums) basically asked how long we wanted the leg length/inseam on our shorts. They run particularly large on shorts (even the size S is huge on me). If Bill is happy with a particular short from one of those companies he can order a small batch for himself. I did that with Verge, buying a six-unit batch of thermal bib knickers for just myself, and I also got a similar batch of normal size M bib shorts. Locate your nearest dance studio; they can connect you with a tailor who can work on Lycra. Some of those dance recital outfits make Assos look cheap.